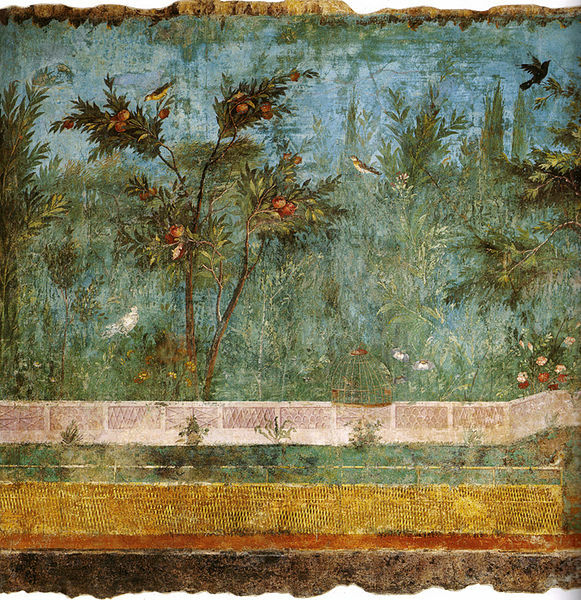 On my second trip to Rome I came upon the frescoes of Livia’s Garden Room, an experience for which I was, to say the least, unprepared. The pale light and quiet in the museum gallery was in welcome contrast to the glaring sun and hubbub of the street. The experience of being transported to a cool and lush otherworld took me to a place the likes of which I had never before been – the likes of which I had never before imagined to exist. Around me on all four sides was a room frescoed from knee level to several feet above my head with the most remarkable, breath-taking garden. Fruit trees branched into full foliage, heavy with clusters of ripe fruit and bouquets of blossoms. Birds flew and perched and, like the fruit and flowers, seemed to give the leaved branches their purpose -all this in layers against cerulean or manganese blue. The painters had softened the foliage in the middle, behind the sharper-edged front rows of trees, to create an atmosphere of sun-filtered haze. One could smell the ripe fruit in the dampness of those cool shadows. I moved slowly, but in that first walk around the Casa di Livia fresco garden room I remember I never stopped. My excitement was too much, not allowing me to stop or study a single spot, but my slow walk kept the breeze blowing somehow. It kept the film running and leaves turning in the wind to show their silvery undersides; birds fluttered, and heavy fruit swung gently. For the first time in my life I felt myself totally subsumed into a painting. The immersion was sensorial, of course, but more complicated than I had language with which to express it; as a traveler I felt at home; as a country boy in the city I was home again. In my wanderlust and restlessness I had the feeling of arrival. Above all I felt humbled but proud in some crazy almost tribal way about what ‘painting’ could do. Here I was in an Edenic experience and I felt appropriately pre-verbal. I returned over and over again to that room, discovering dimensions of this most remarkable painting that have come to have a profound impact on me in my studio. First of all there was a way that the frescoed room, while offering so much plentitude, did not reward ‘close-observation’. Thinking of Marshal McLuhan’s distinction between “hot” and “cool” media, something “cooler” could not be found. If we do not look directly at the fresco and we don’t stare too deeply, then we become aware that to see a square of paint here-as an incident- is to miss a vastly larger splay of squares over there. We respond to this immediately and ‘release’ to other areas, our attention skipping like a stone on the surface of a pond. Why throw all in and be lost to the depths invisible when we can skim and stay in the cool glistening visible world? Secondly, in a most ingenious way, the garden threatens- almost promises- pattern and yet no repeated forms establish that. There is a back and forth between ‘decorative’ and ‘descriptive’ that these painters (like Poussin or Warhol) understood so well. And, as with other Roman paintings, the beautiful exchange between the very delicacy of the image and the huge weight of the wall moved me. The light of the painted image is more fleeting for being effervescent on the immovable permanence of the thick walls. I began to think that the armature was offering what the moment-to-moment experience denied. It seemed to say ‘this will be a good month, a good year- but the next minute is uncertain.’ I noticed on many occasions how people strolling along the painted fence activated the painting, providing a new life and scale as they chatted and moved through the garden. But, most mysteriously, while its hold on me has never diminished one iota, the painting has not become more accessible over the years, but in fact less so. Bewildering, yes, but energizing too. Thinking about Rome, Brodsky wrote, “The most definitive feature of antiquity is our absence. 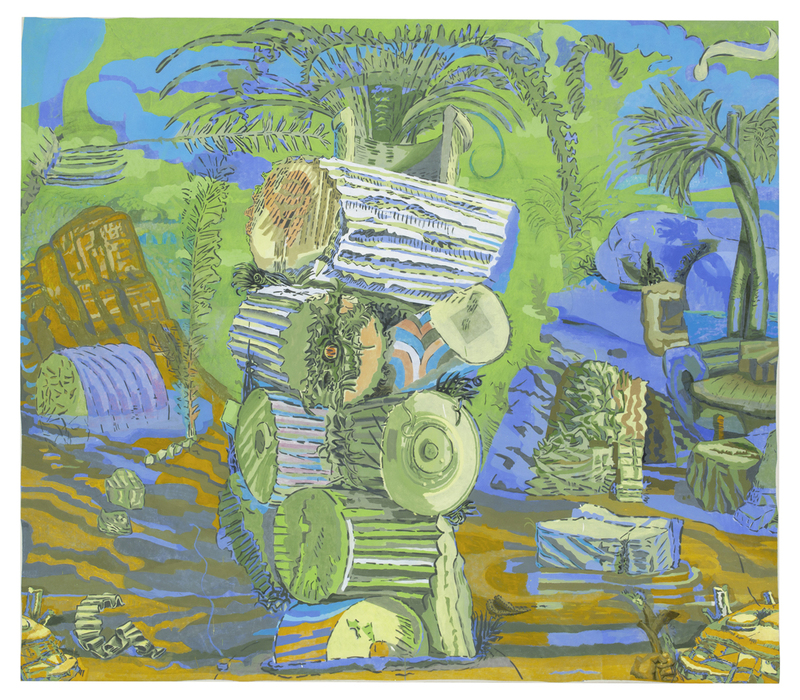 The more available its debris and the longer you stare at it, the more you are denied entry…they were not meant to reach us.” It is while working on my own paintings that I can sometimes gain proximity, if not entry, to Livia’s remarkable garden.